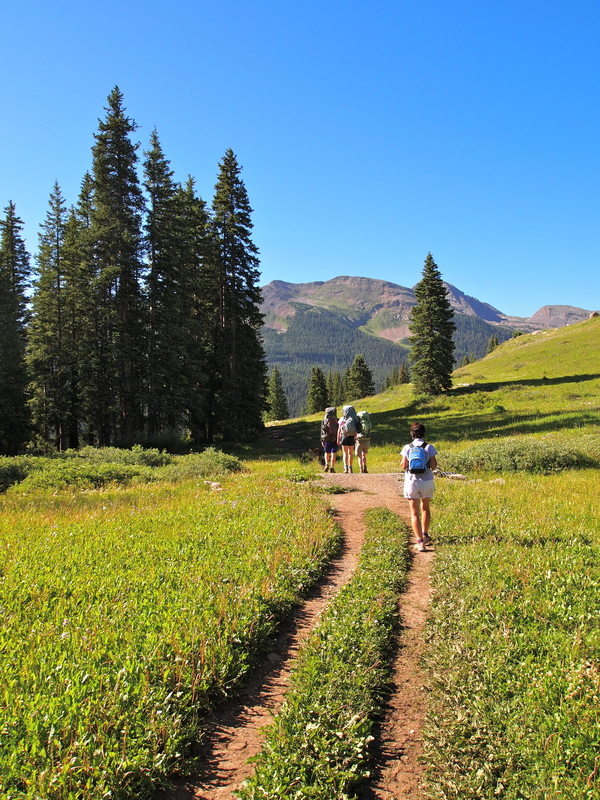 Hiking the Colorado Trail is a perfect way to spend the day! The scenery is picture perfect! 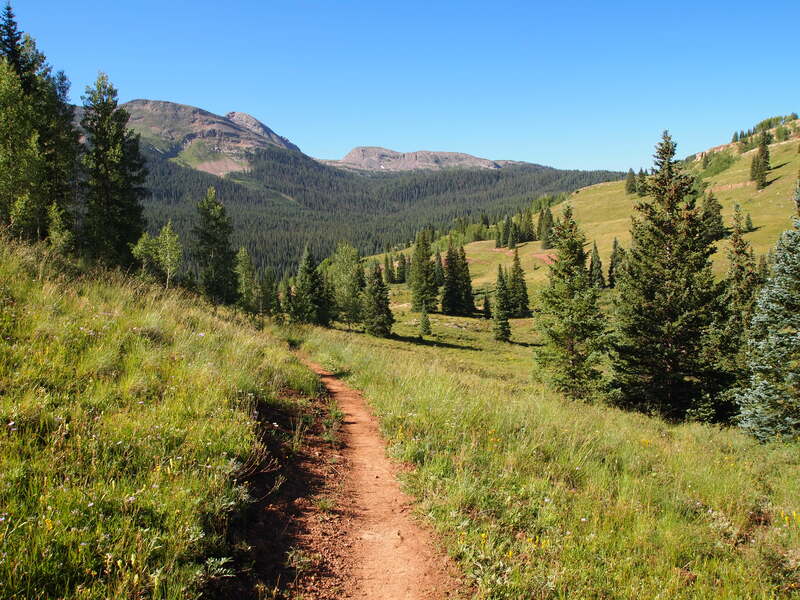 I hiked a portion of the Molas Trail, an 8 mile round trip hike, that descends to the Durango Silverton Narrow Gauge Railroad, and follows the Colorado Trail for a little ways. The weather couldn’t have been better…it was in the 80’s and sunny! A perfect August summer day! I love the smell of pine trees and they were everywhere! To me…there is nothing better than to be getting exercise while hiking…with gorgeous trees, mountains, flowers and sky to gaze at! I had to take a photo of this dead tree. I’m not sure what my fascination with dead trees is…perhaps their starkness. It’s always nice to take a break and just be! 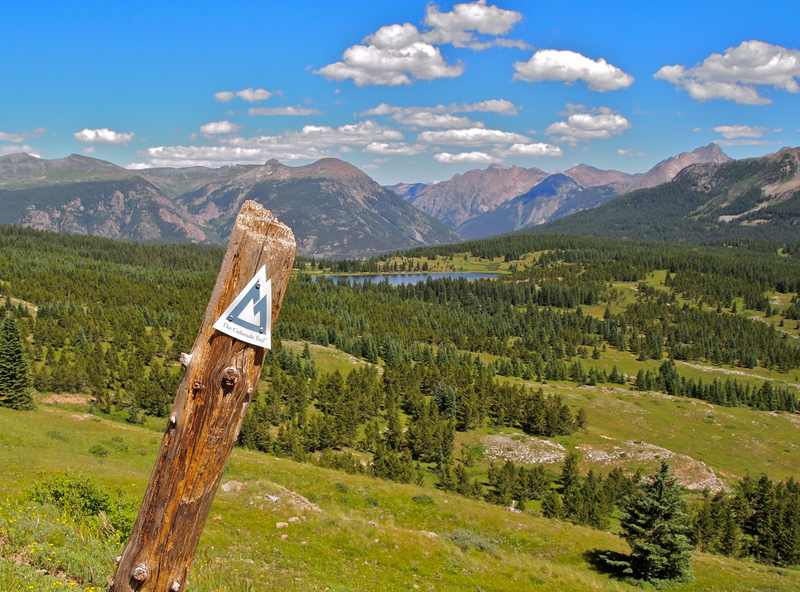 If anything ails you…take a hike in Colorado! Wow, you’ve got some beautiful pictures. Colorado is a beautiful place to hike too. I’ve not done this hike though. Thanks very much! Also for stopping by! WOW ! Such stunning scenery. Oh how I wish I could hike with you. Thank you…I’m appreciating it more right now because I’m temporarily wearing a shoe/boot thingy to prevent me from putting pressure on the ball of my foot…to give it time to heal. I won’t go into details…but it makes you realize how lucky you are when you’re able to do the things you love! 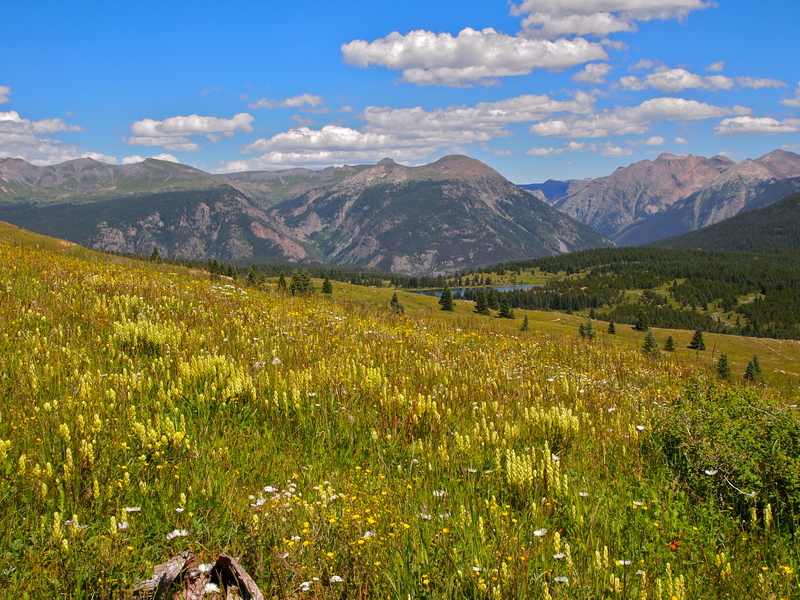 Beautiful views .. and that photo with the meadow …. all the yellow flowers. Thanks Viveka…I like that one too! 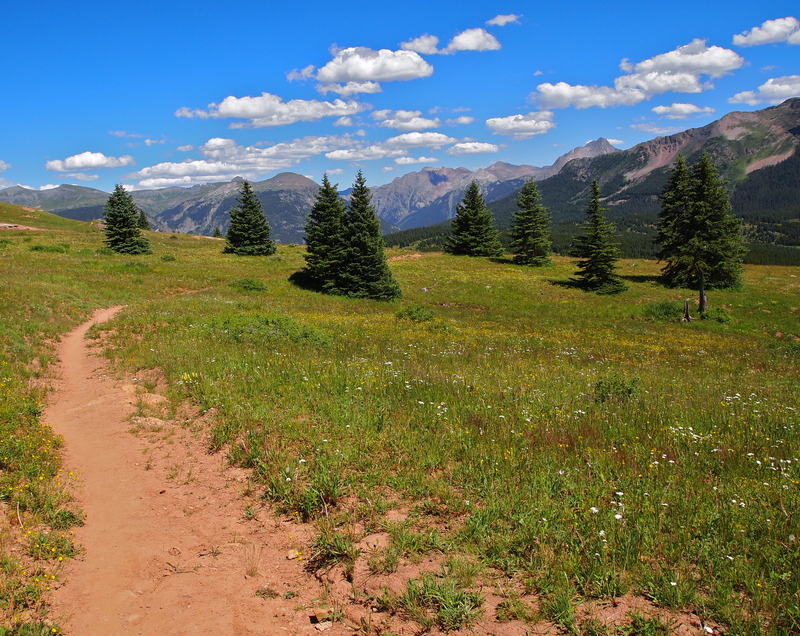 I hiked chunks of the Colorado Trail when I lived there. Great photos!!! I want to live there…it’s so beautiful!! Thanks Cee! Oh, this makes me so nostalgic! I lived in Colorado for 22 years and spent so much time in the backcountry — your shots capture it SO well!! I would love to live there! Thanks Betty! That is so sweet of you Pat…thank you!! I know what you mean…makes me want to go now! Wonderful scenery, Sherry. Looks like the most beautiful place to go hiking. Thank you! I want to hike the Camino also! I will definitely follow! Sherry, If you haven’t seen the movie “The Way”….you must! It is a story about a father (Martin Sheen) who walks The Way in honor of his son. Because I love Spain so much….the movie really touched my heart! My friends & I made a commitment to walk The Way…..not sure when but we definitely are going to knock this one off our bucket list. I did see the movie Sherry! Loved it! That’s cool you want to do it also! I’m putting this on my list. The only hiking we’ve done out West is at Tent Rocks, south of Santa Fe. Worth checking out if you haven’t already! That’s funny you mention there. My next hiking post is about my hike there! Thanks for commenting! In my university years I spent 2 months in a tent near Gunnison, CO doing field geology. I have many fond memories, but the smell of pine needles (especially when heated by the sun) always brings that summer back to me. Great Photos! That sounds like a great time…I love camping! Thanks! Beautiful place to hike! Good that you took photos. Oh you do get to hike some wonderful places…I’m quite envious of it… but then you share them with us in such a wonderfully pictorial way that I should just shut up and enjoy… thank you.. Thank you! I’m happy you get to come along! !